C.A.W. HVAC Company Inc is proud to serve the Portland community! About Portland, TX - Happy to be your hometown Heating & Air Conditioning Contractor! Portland is a city in Texas with a population around 16,000 residents. The area is well-known for its natural amenities, as well as its historical value that dates back to the 1800s. 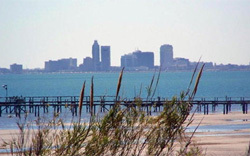 Public education services are provided by the Gregory-Portland Independent School District and for continuing education there are several colleges in nearby Corpus Christi. Portland is home to a variety of attractions, events and festivals. There are also many parks and recreation areas which offer activities such as hiking, biking, boating, skating, golfing, bird watching, fishing, swimming and more. Sunset Lake Park is a natural wetlands environment and has a 2 mile lakeside bike trail. Indian Point Park is 55 acres of enjoyment for nature enthusiasts and fisherman as it features a beach, fishing pier, and it has some of the best saltwater fishing in the Coastal bend. Water fun and exercise can be enjoyed at the Portland Aquatic Center. Broadway Park is a natural area that has a beach and many other amenities. The climate in Portland is warm to hot throughout most of the year. Winters are mild, allowing the beautiful natural amenities of the area to be enjoyed year-round. It's the perfect getaway for nature lovers, fisherman, outdoor recreation enthusiasts and children.